I’m sure when some of my friends saw me playing Akiba’s Trip: Undead & Undressed after logging into PSN they were a bit confused. At first glance this game looks like a perverted strip-fest not so cleverly disguised as a beat-em-up action game. Thankfully, the story and gameplay take precedence over any kind of lewd act, but is it worth your time? 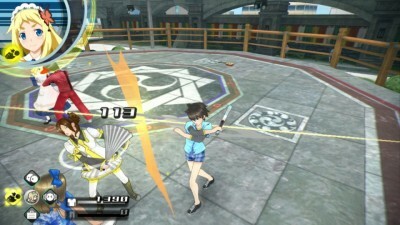 Akiba’s Trip is an action game where you patrol Akihabara, a real Japanese district the developers recreated for this game. Similar to the Yakuza titles, you run around completing main missions and side missions that generally involve beating people up. The twist, however, is that in this game you’re beating up vampires, and since they hate the sun you obviously have to strip them of their clothing for maximum exposure. Players take on the role of Nanashi (or Jerome in my game), an otaku turned vampire hunter after being captured by a mysterious organization that genetically engineers “Synthisters,” beings that prey on the social energy of others similar to how vampires prey on the blood of their victims. You and your wacky supporting cast are tasked with finding out who is running the show and putting a stop to them. There are various endings you can get depending on which characters like you the best, including an ending you can trigger five or so minutes into the game. Overall the plot is very straightforward and doesn’t really offer any major twists, which is surprising considering the idea of the game itself is rather unusual. The game’s humor tries its best to keep you interested in the story, but it never hit the right notes with me. The characters are all very likable and have their own unique personality, but a lot of the jokes are either super cheesy or Internet memes from five years ago. The story segments wear out their welcome pretty quickly too. After every mission you are treated to lengthy cut-scenes of static anime characters standing around talking about anything from the mysterious organization they still know nothing about to what they should cosplay as for an event coming up. There’s even a fast forward button, probably for additional playthroughs, which I was oh so tempted to push on many occasions. When you’re not listening to your anime friends banter you’ll be on patrol in the city looking for Synthisters. Instead of being a seamless city, Akihabara is split up into many small sections with load times in between each one. You can also fast travel between sections, which alleviates the problem a bit, but the city feels so disjointed that I never really got a sense of direction for where I was going. The city itself feels more like a ghost town than a bustling Tokyo district. Instead of actually entering the many shops around town you’re greeted with a screen and a generic shop keeper, and a lot of the stores carry the same items. The people walking around also take a while to load, so odds are you’re going to be walking around in the empty streets or waiting for someone specific to load. Worse still, as you walk around the city you’ll notice constant frame rate drops which is disappointing to see with any game. It doesn’t affect battle and it’s not game breaking by any means, but it is worth pointing out. See those figures way back there on the sidewalk? That’s what pedestrians look like before they load. When you finally find who you’re supposed to fight, you have another brief exchange before combat. Combat consists of high, medium and low attacks, and the objective is to weaken the enemy’s various articles of clothing before stripping them off. The game teaches you how to block and counter, but it’s more effective to just button mash since you do more damage once your combo meter reaches a certain level. The combat takes a while to get used to, but ends up being pretty entertaining for the most part. Unfortunately, the lack of enemy variety will slowly wear you down as you think, “Surely there has to be something different soon.” Even the so-called boss fights are just slightly more powerful regular enemies. Because of this, the game boils down to watching a cutscene and fighting the same group of enemies over and over again. The cut-scenes are all static and usually very long. 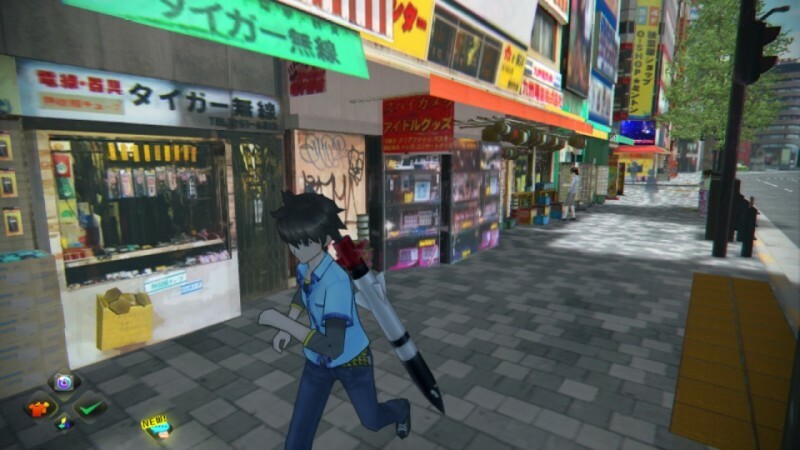 There are vast amounts of different weapons and clothing you can use in Akiba’s Trip, but once you unlock the upgrade feature you’ll probably just stick with what you have and wear the same thing for the entire game. To upgrade, you just pick what you want to beef up, pay 1,000 yen and mash it together with something else from your inventory and that somehow makes it more powerful. This ends up making all of that unique equipment useless because once you get to a certain point nothing you find will be as good as what you’re wearing. The game even pokes fun at itself because the upgrade system is so basic, which can’t be a good sign. 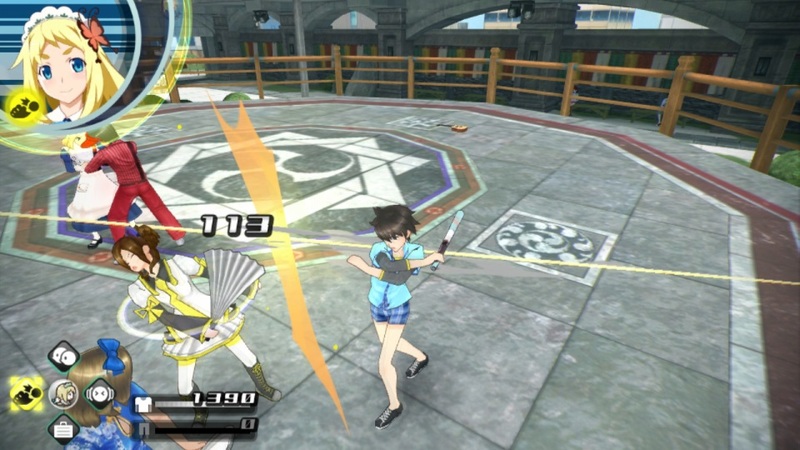 Akiba’s Trip doesn’t employ the most cutting edge graphics, but they aren’t bad by any means. 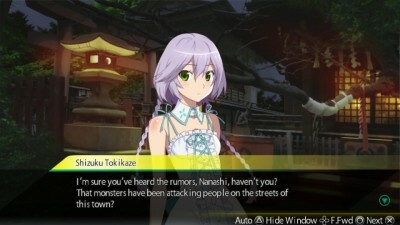 The city itself looks good despite the technical issues with the people not loading right away, and the characters are cel-shaded which is usually best for anime-style games. All of the main characters are unique and drawn with a lot of personality. However, everyone else’s art and models are repeated quite frequently so don’t be surprised when you fight the same fanboy for the 5th or 6th time. The soundtrack and voice acting are surprisingly the shining stars of Akiba’s Trip. The soundtrack consists of mostly J-Pop with some hip hop hidden in there too, and the ambient sounds of Akihabara are the only things that make the city feel real. The English voice acting is also very well done. Each character has their own distinct personality and only a couple of the really cheesy jokes felt forced. At the end of the game I felt like I cared about the characters and I think that was largely due to the voice acting. It’s a shame that a game with such an original and wacky idea plays it safe on just about every level. Akiba’s Trip follows a very basic formula of fighting an enemy and returning to home base, and when you pair that with a predictable story and one enemy type you get a pretty unremarkable game for a very niche audience. Nothing really stands out and if you strip the stripping mechanic away you’re left with a monotonous grind with no variation whatsoever.